Open your web browser and type itd.schooldude.com into the address bar and hit the Enter key. Bookmark this page or create a shortcut on your desktop to make it easy to come back to this page later. 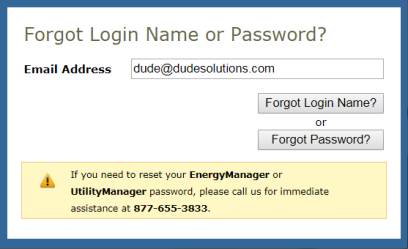 On the Account Login screen, enter your Login Name and your Password. Make sure that Incident is selected in the Go To box. Home - takes you to the Incident home page. New Incident - where you can enter a new incident. Reports - takes you to a list of fields you can run reports on. My Settings - links to your personal information page, where you can change your password or update your information. MyDude - where you can access content within the Dude Solutions community. The Search For box under the Home tab can be used to find a specific incident or group of incidents. 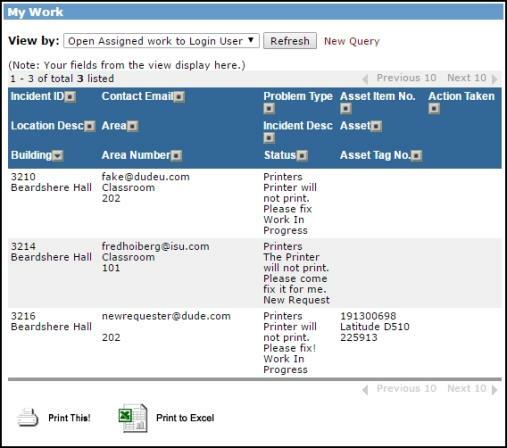 Enter a incident ID number to bring up that specific form or enter a keyword to bring up a list of incidents associated with that term. The Advanced Search link takes you to a more advanced search form where you can select multiple criteria to find the incidents you are looking for. The graph in this section reflects the number of incidents assigned to you by status. 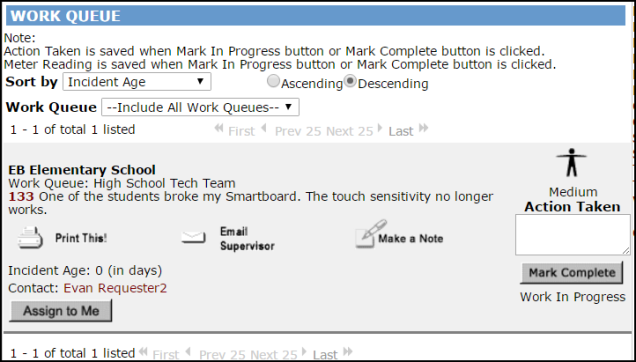 You can use the Period drop down menu to change the time period being displayed, or you can use the Work Queue drop down menu to filter incidents by work queue. The My Work section allows you to select queries that you have access to run to show that information right on the homepage. 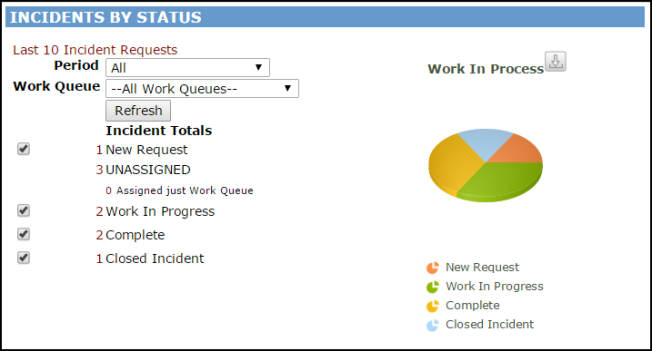 If you belong to a Work Queue, incidents assigned to that work queue will appear in this section of your home page. If applicable, you can assign incidents in this section to yourself by clicking the Assign to Me button. The incident will then be removed from this section and will appear in your Assigned Incidents section. You can sort the list by Request Age, Incident ID, Priority, Status, Location, Work Queue, or Request Description in ascending or descending order. If you belong to multiple work queues, you can select a different work queue from the Work Queue drop down menu. 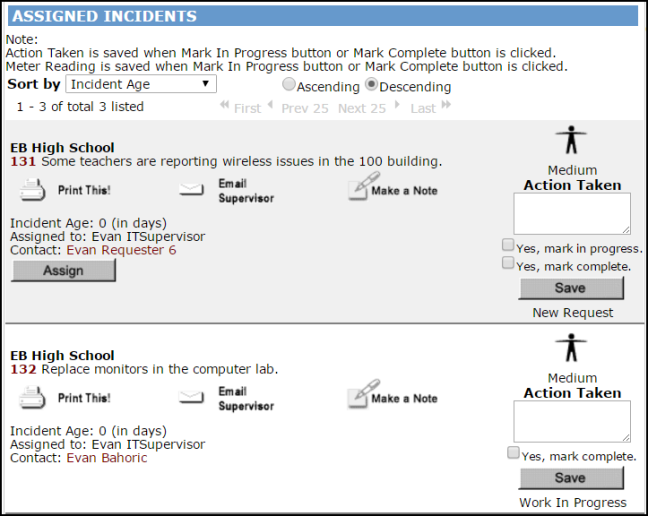 The Assigned Incidents section of the home page will show a list of incidents assigned to you. From this section, you can print the incident, add action taken notes and today's labor hours, and mark the incident as In Progress or Complete. You can sort the list by Request Age, Incident ID, Priority, Status, Location, Work Queue, or Request Description in ascending or descending order. You can also filter the list by any open status. This section provides commonly used links including the User Forum, New Incident, Print Incident Batch, MySchoolBuilding, and a link to the SchoolDude.com website.